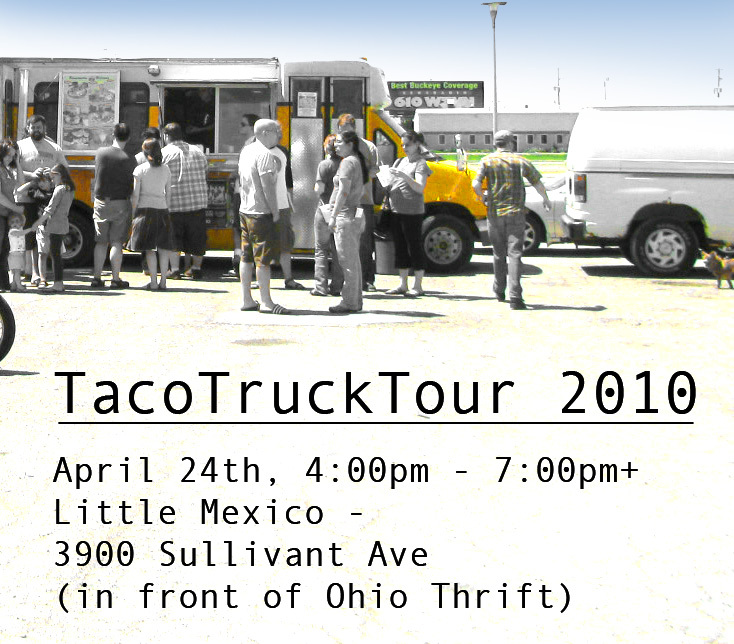 Taco Truck Tour 2010 (and after party) This Saturday! First off, a big thanks to Hal and Al’s (on Parsons Ave) who have kindly offered to host an after party for the taco tour. For $8 you will get 4 different bottles of Mexican beer – Dos Equis Amber, Dos Equis Lager, Sol, and Tecate – in a Dos Equis bucket that is yours to keep. There will also be Jarritos Mexican sodas, for those who don’t want beer. I have a feeling that you may have a large turn-out, even with the rain! There is alot of excitement in the Hilltop community about the event! This looks like lots of fun! Will you plan on having future tours throughout the summer? We forsee at least a couple more events this summer – including a smaller one fairly soon. More details after we get through today’s event. Houston should have something like that. Except the Taco trucks have regular stops that they go to every 15 minutes and there are hundreds of them in the city. They also have a big Latino festival that last all day and till midnight that has all of the Taco trucks lined up like the wagon trains used to in a circle. The stuff that you buy in the food in nothing like the kind you buy off of the Taco trucks. That’s the REAL McCoy! Yum, Yum. Sorry I missed it. Would have been a nice scooter ride from Cincinnati. Will try to make the next one for sure. The food sounds great. This is so awsome… its great that you’ve taken the time to do all this, wow! Great job, website, articles pictures and the Taco Tour very impresive never thought someone would take the time and think of something like this… Great!